Very Heavy Rain Event Last Evening! 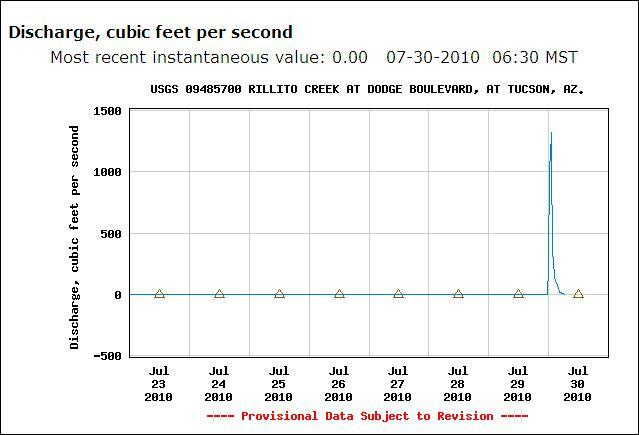 Exactly four years ago today extreme and record floods occurred in the Catalina Mountains, Sabino Creek, and the Rillito - it was nearly a repeat last night, with heavy rains across much of NWS Zone 33. Only 23 gauges in the ALERT network had had rainfall during the past 6-hours at 7 pm last evening. But this morning, 100% of the 93 gauges in the network have had rain, with some very heavy amounts. An amazing number of the gauges measured over an inch - 48, which is more than half the sites. More than 2" was reported at 16 sites; more than 3" at 3 sites; and more than 4" at 1 gauge (Altar Wash at Highway 286). Reports of serious weather were of the resulting flooding; I didn't find any reports of severe thunderstorms events. Curiously, for the second night in a row during the big storms, TUS at the airport did not report thunderstorms; whereas, DM AFB only a few km away reported thunder numerous times each night. Rainfall here at house was 1.27"; so 2.60" in two days; this will make the July rainfall total quite respectable. Brief postmortem - this event far exceeded anything I expected. The boundary layer cooked up nicely during the day and grew deeper than I had expected, reaching almost to 700 mb by the time of the 00Z sounding. The SPC plot at top shows the Tv lifted surface parcel having moderate CAPE. The GPS PW data indicated that the sounding was too dry by about 5 mm - so there was more instability present than the RRS sounding data indicated. Strong storms moved across the Santa Cruz Valley south of Tucson around 6 to 7 pm. These storms generated a significant, mesoscale outflow boundary that passed TUS and DM between 7 and 8 pm, with wind gusts from the south to southwest of 30 to 35 mph. This outflow moved north across the metro area and onto the Catalina and Rincon mountains, forcing new storm developments (see TUS NWS radar middle image). A weaker outflow had moved, from storms to the north, southward across the metro area between 5 and 6 pm, so that colliding, interacting outflows produced the initial storm developments at lower elevations. 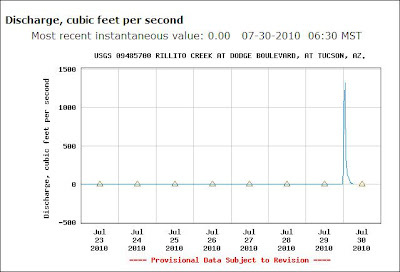 The very heavy rains resulted in the nighttime flow in the Rillito that peaked above 7500 cfs as per USGS gauge data shown in bottom image. 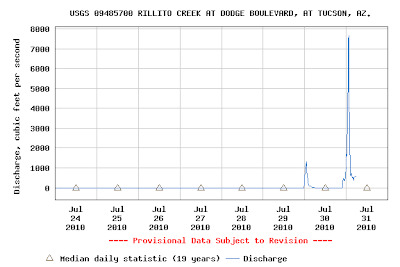 Thus, flow in the Rillito was six times as great as the night before (see earlier post), but nowhere near the record flow of 30,000+ CFS that occured on this day four years ago. I have some appointments this morning and have time for only a quick overview of the situation today. The morning sounding at TWC (top) is a bit too wet wrt GPS, but remains very tropicalish. CAPE is much down today, after yesteday's widespread storms. The cool layer near the surface indicates that a new boundary layer will likely grow from the surface during the day and that it will not be very deep, although it will have some CAPE. This type of situation requires strong outflow forcing to kick the BL if storms are to occur at low elevations. The steering flow is a bit stronger today, but is forecast to weaken some during late afternoon and evening - will be useful to monitor the wind profilers at Marana and Ft. Huachuca today, and also to watch for development of storm lines to the east. The NAM 500 mb forecast for midnight shows the weak inverted trough (IVT) trying to cutoff again and also to remain to our east. In the upper-troposphere the leading IVT weakens over the lower Colorado River Basin, while the trailing IVT strengthens and moves into central Mexico and west Texas. It remains a very chopped-up, messy synoptic setting, with all of the above occurring essentially within a huge, subtropical anticyclone. Storms today should tend to be mountain storms, since chances for a strong squall from the east don't appear to be great, as the lower elevations cook and regroup for tomorrow or next day. Both major metro areas in Arizona were hit by significant storms. Yesterday afternoon (July 29th) the storms that formed west and northwest of Tucson rolled down the Santa Cruz River valley with a strong outflow and dust. Another outflow came south from the mountains north of Phoenix and the two collided over Phoenix, producing strong new storm development over the city. 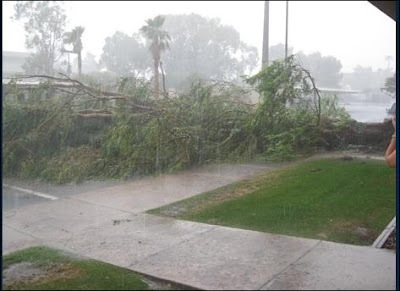 There was widespread wind damage in the metro area, and Art Douglas, who was there, reports chaos at Sky Harbor airport from 3pm well into the early nighttime. The top two images show rain and downed trees in Tempe, and the SPC storm report map for yesterday (the points plotted around Phoenix don't really convey the extent of the event up there). I will check out the Phoenix Rainfall Index maps later this morning. 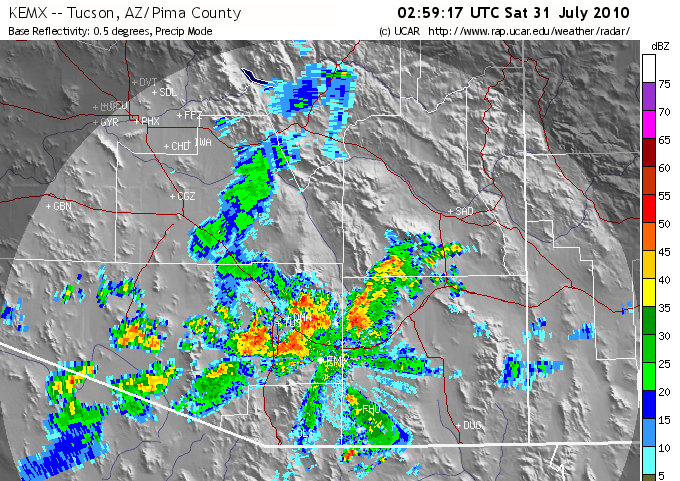 Here in Tucson, storms avoided the city during the afternoon, but the last round of storms developed late, as several had predicted yesterday, and moved across the metro area just before and after midnight (e.g., the Atmo weather station on campus recorded 0.69" before midnight and 0.29" after midnight). Here at the house the heaviest rains seemed to occur just before midnight, with rumbling thunder and quite a bit of mostly in-cloud lightning. There was 1.33" in the gauge this morning; the first summer storm event here at house with an inch or more rainfall since August 31st, 2008. At 6 pm last evening only 20 of the 93 ALERT gauges had gotten rainfall during the past 6-hours, but this morning 80 of the 93 gauges had measured rain during the past 24-hours - so a very widespread event, finally. Six of the ALERT gauges had more than an inch of rain; DM AFB had 1.17",and three of the RAWS gauges had more than inch. So, much welcomed widespread and significant rainfall in the Tucson area. When I walked, just after sunrise, this morning the air was pleasant and filled with the smells of the rain, mixed with those of many desert plants - a wonderful morning in the low desert! I didn't see any evidence of strong winds in this part of town. But I saw that the spadefoot toads had emerged last night - several active in large puddles and more run-over in the streets. The final showers were still in view, with a sunrise rainbow out to the west. 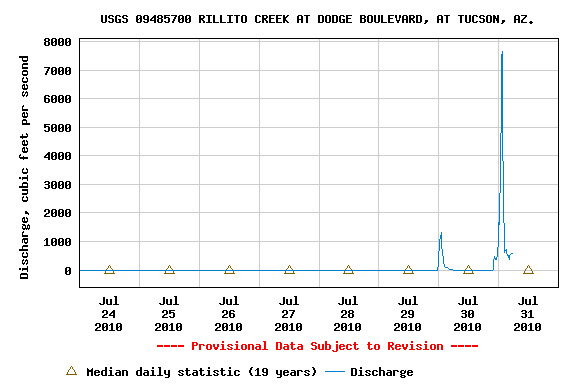 The Rillito had flowed during the night, but the very dry soil soaked up the water very quickly - see bottom graphic that shows flow at the USGS river gauge at Dodge Street (about a mile or so from the house). Flow spiked quickly to about 1300 cfs right after midnight and just as quickly fell right back to zero. The only negative impact of the rains I observed this morning were large swarms of flying ants and/or termites out in force. KFGZ PW reads a bit higher than GPSMET today. Nonetheless, these very high readings rank at the 99.9 percentile for all soundings at KFGZ (1996-2008). Truly an extremely moist air mass. David adds note that: Thse plots combine data from both KFGZ and KINW. There is over a 2000 foot difference in elevation between these two sites and a large difference in PW climatology. For example, the 75th percentile of PW at KFGZ roughly corresponds to the 50th percentile at KINW. I have have posted the long-term precipitable water climatologies from the sounding data above. These have been calculated by Matt Bunkers, SOO at Rapid City, and are available through the following Central Region URL for the entire CONUS. Flagstaff 1.33"; Tucson 1.79"; and Phoenix an amazing 2.18"
It's a bit of a difficult situation today. The morning TWC sounding (top image) is of a tropical nature with very high moisture content. The sounding data indicate an unstable lifted parcel with theta-w of 26C, and note that the 850 mb Td is an amazing 19C! It would seem that a good, hearty sneeze should instantly kick off a thunderstorm. However, the morning sounding is about 5 mm too moist wrt the GPS precipitable water - I don't know where that extra moisture is in the sounding plot, but I suspect that it's very near the surface. If so, this makes the sounding not quite as unstable as it would seem to be. Further, the wind profile remains light and variable (see the current, very pathetic hodograph in upper right of the SPC sounding plot), with no significant steering flow as of yet. So, we should expect strong storms to kick off, early, over the mountains. But it is not obvious where the storms will want to propagate to - perhaps wherever the most unstable air is at lower elevations. The middle plot is the RAP 500 mb plot and analysis for 12 UTC this morning. It shows that the closed low that has been malingering over Texas for the past few days has opened up into an inverted trough that is moving westward in the subtropical easterlies. The inverted trough stretches from northwest Mexico northeastward to the Oklahoma Panhandle currently. However, the height gradients remain weak, and the strongest winds at 500 mb seem to be over northern New Mexico. So, the big question for the day is that of how will the winds change between now and midnight? The morning NAM forecast run today indicates that that model keeps the steering level winds quite light, while increasing the upper-tropospheric from the northeast. This not a great shear profile for southeastern Arizona, since anvils tend to spread out over the lower elevations. The NAM indicates more precipitation by midnight over south-central Arizona and also over the southeastern mountains (see bottom panel which is 12-hour QPF ending at midnight tonight). However, the NAM forecasts a better wind profile tomorrow and also Saturday, with a really big precipitation event forecast for all of southern Arizona for the 12-hours ending midnight Saturday night. Can it hold off that long? I doubt it, but much will depend upon how things evolve today! Yesterday - Storms yesterday were not quite as widespread as the day before. I thought that around 2:30 pm new cells were building in an excellent location to come across the house. I was busy for awhile and by the time I looked again around 5 pm, the cells I had observed earlier had totally crashed and there were new storms out to west and northwest. So, another day with no rain here at house. There was observed rainfall at 47 of the 93 Pima County ALERT gauges with heaviest amounts on the mountain paeks - 0.98" at Mt. lemmon and 1.61" at Manning Camp in the Rincons. Of the regular reporting stations, Nogales had a heavy storm and reports 1.00" in last 24-hours. 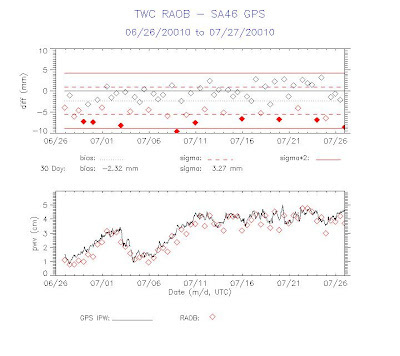 Three high elevation RAWS stations had more than an inch, with Columbine on Mt. Graham reporting 2.33". Up in the Phoenix area there were some storms in the Valley, but PHX at Sky Harbor reported only 0.02" - giving them a total of only 0.06" since June 15th. 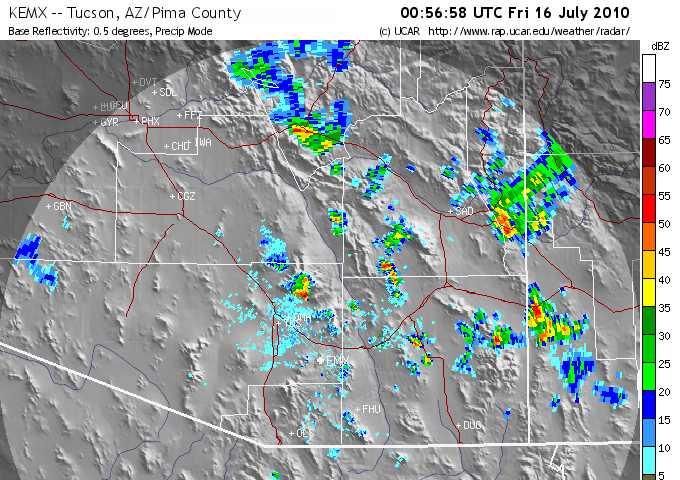 Luke AFB had a heavy storm between 3 and 4 am this morning - however, their ASOS (I think?) precip gauge is bonkers and total rain is being reported as 36.81"! Proposed New NWS Forescast Zones - The NWS proposes to change the southeast Arizona forecast zones this coming October. From their web page - the current zones (7 of them, with Tucson Metro being zone 33) are shown in the top image and the proposed zones (13 of them) are shown in the bottom image. The change breaks out the principal mountain ranges as separate forecast zones, which certainly makes sense wrt climate zones and weather. I think the elevation break is around 5,000 ft MSL. 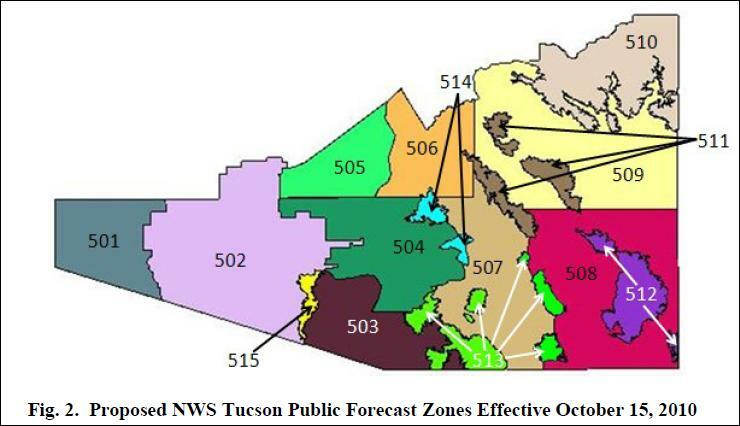 The Pima County ALERT gauges span a significant range of elevations and demonstrate the current challenges of forecasting for zone 33. There have been several events this summer when precipitation coverage was near 100% at higher elevation sites while there was 0% coverage at low, metropolitan gauges. The ALERT network has 47 gauges sited below 3,000 ft elevation and 46 are at higher elevations. During the past 24-hours 23% of the gauges below 3,000 ft had rainfall, while 78% of the higher elevation gauges had measurable rainfall. This should be an interesting change, come October. Not too much in way of changes since yesterday. The weak, west-east 500 mb (top image) trough in northwest Mexico has perhaps shifted a bit to the west and the same is true of the mid-to-upper tropospheric cyclone cutoff over north Texas.The 500 mb pattern remains very amorphous, with a huge subtropical high covering all of the southern 2/3rds of the country. The main center of the high has shifted westward to the northwest GoM. Height gradients remain very weak over the Southwest and Mexico. The TWC morning sounding now indicates light southeasterly winds through much of the troposphere, but there is virtually no shear - see the hodograph above on the SPC middle graphic. Upper-levels have moistened following the active convection of yesterday. The CAPE remains moderate and the lifted parcel continues to have theta-w of about 25C. So, sunshine and the mountains will drive today's events - there is a large, mostly clear region form south of Tucson well into Mexico. This morning's NAM forecast run indicates less precipitation today (bottom graphic is 12-hour rainfall ending at midnight tonight). This may be a bit conservative, if we get much sunshine. The NAM continues to forecast the Texas cyclone to open into an inverted trough, and to move steadily westward into the weekend, crossing most of the Southwest and northern Mexico. A pronounced region of upper-level difluence will likely be leading this feature, and the forecasts indicate that it will begin affecting southeast Arizona by this evening. Thus, an interesting weather week will continue, with lots of forecasting challenges. Yesterday was an active storm day over many parts of southeastern Arizona. Storms developed early during the mid-to-late morning over higher terrain. Had a shower here around 2 pm and then light anvil rain later in afternoon. 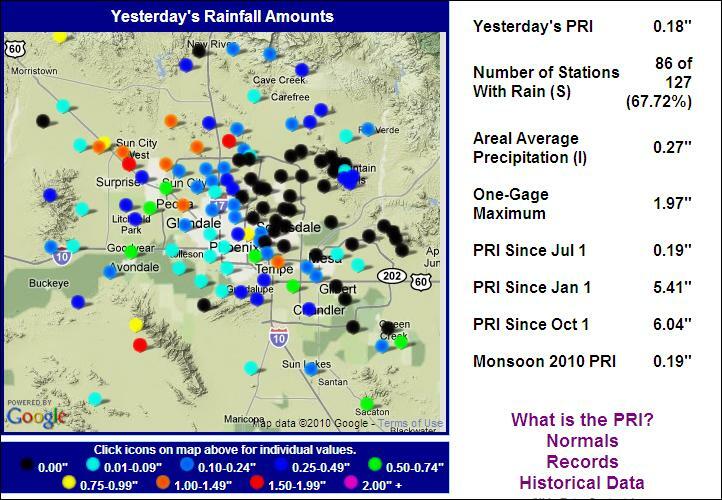 The Pima County ALERT network recorded rainfall at 64 of the 93 gauges - so a very definite up-turn day with high POPs. The storms did tend to stay at higher elevations and few gauges in the actual metro area recorded rainfall, and those that did had very light amounts. The heaviest storms skirted south of Tucson along higher elevations near Green Valley - as is often the case, especially with light steering flow. Here at house we had 0.08", which was a high total for the low elevation stations. Notable amounts during past 24-hours: 17 ALERT gauges had 0.50" or greater; 8 gauges had 1.00" or greater; and two ALERT gauges had more than 2.00"; Douglas reported 1.06" and Mt. Hopkins had 0.76." The Tucson NWS radar at 3 pm indicated a very large storm south of the city - this storm had tops well above 50,000 ft and produced wind damage near Sahuarita, downing poles and power lines. An hour or so earlier, a strong storm near Sonoita produced a rope-like tornado that was videotaped and shown on TV news this morning. 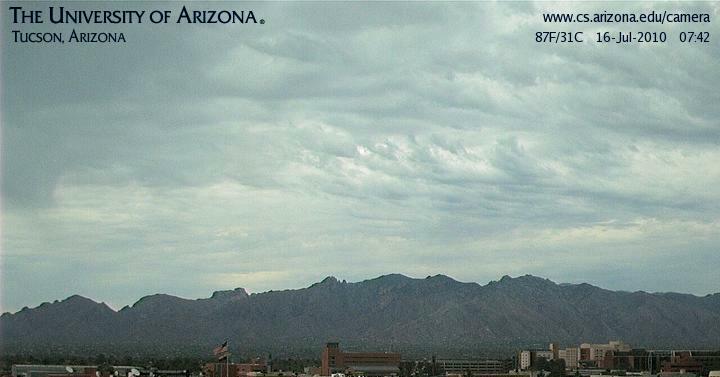 The large storm shown on radar above produced a cool, strong outflow that moved north across the city, resulting in the low stratus band along the Catalinas shown in bottom image. This morning it is very humid across almost all of Arizona with dewpoints in the upper 50s and 60s, even at high elevation stations. 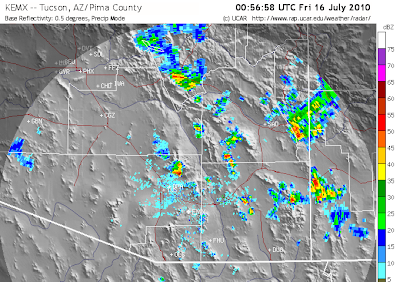 The GPS precipitable water data indicate 50.5 mm here at Tucson and 56.4 mm at Phoenix - very high values for here. The surface observations at Tucson indicate that it is 5F cooler than it was 24-hours ago; Td is up by 5F and the SLP is up by 3.5 mb. Similar changes were also noted at Phoenix this morning. Was a very sweaty walk at sunrise. I did see something that I have never seen before - I observed a hawk trying to grab a bat in flight. The bat got away. Even though it is late in July, I have yet to observe any spadefoot toads out and about - just not wet enough yet in this part of town to produce the large puddles of standing water that bring them up. Paul from Phoenix comments on the post about last evening's TWC sounding that was very dry relative to GPS value: I am sure the NWS forecasters are very aware of the issue with "dry" soundings and can easily account for the discrepancy when analyzing the sounding. Impacts on the short term forecast should be negligible at best. Blue inserts are my annotations. Clearly this forecaster believed the RRS data to be accurate and factored it into his/her forecast. I feel that my contention that these bad RRS data do impact some NWS forecasts negatively (both subjective and numerical forecasts) is valid. Yesterday - Had a light shower here at house around 11 am that left 0.01" in the gauge. 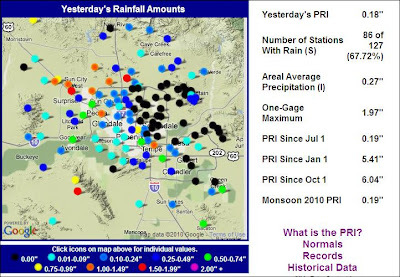 Around eastern Pima County there was rainfall at 21 of the 93 gauges, almost all at higher elevations. Notable rain amounts last 24 hours - 1.34" at Manning Camp and 0.91" at Coronado Camp. At the routine reporting stations in southeast Arizona, Safford had 0.61" and Nogales had 0.78". At the RAWS stations, Carr had 1.27". So, yesterday was definitely an upturn relative to Sunday. 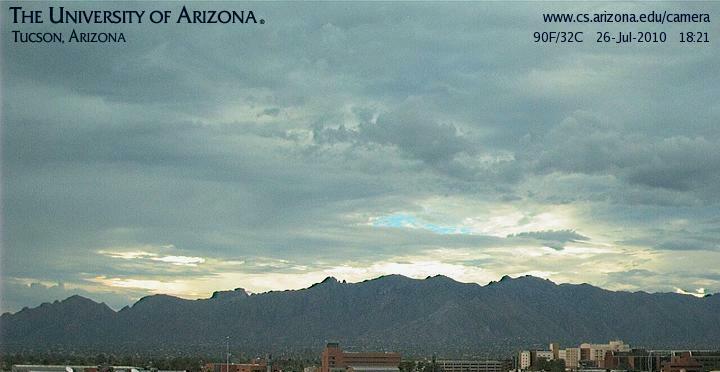 Today -Another heavily overcast morning at Tucson (see top image). Dewpoints are quite high in the southeast, with a drier slot of air across south-central Arizona (just as the U of A versions of WRF model had predicted!). Cloudiness is very extensive over Arizona and all of northern Mexico this morning (see visible satellite image, middle above), and the middle and upper cyclone over Texas is apparent, having moved little during past 24-hours. The morning sounding at TWC (bottom image) is quite interesting. The troposphere is very moist and tropical below 400 mb, while the upper troposphere is quite dry. With a little sunshine the lifted parcel has theta-w of 24 or 25C, which usually favors strong storms. Even with the very warm mid-level temperatures, there is moderate CAPE at low elevations today. The sounding appears favorable for wet microbursts. Note the very high TWC 850 mb Td of 19C, while Yuma has an 850 mb Td of 0C - reflecting the push of dry, low-level air off the Pacific, again as per WRF forecasts yesterday. PW values are high in the southeast with 50 mm at PHX; 47 mm at TUS (note the sounding is a couple of mm too moist this morning), while Yuma has only 32 mm. However, very moist surface air has surged north again across Yuma, with current Tds in middle 70sF. Large-scale setting remains stagnant with mostly L/V winds in troposphere. The TWC sounding had 20 kts from northeast at 700 mb, but this seems to be an outlier when compared with the winds at Marana and Ft. Huachuca profilers. The morning NAM moves the weak 500 mb inverted trough slowly westward today along the borderlands, increasing the 500 mb winds from the east. Favorable for letting storms move from mountains into lower elevations - if it happens. The 500 mb height gradients are very weak across a huge area of the Southwest and Mexico. Regardless, it appears that today will see another uptick in activity, with some locally heavy rains and the threat of damaging wet microbursts. Rest of Week -the NAM forecasts continue to dislodge the Texas cyclone and move it westward as an inverted trough, that affects the borderlands and southern Arizona on Thursday and Friday - keeping the rest of the week quite interesting. The Texas system has cooler air in middle-levels, and so it may help to increase CAPE, especially Friday when the NAM forecast indicates a nice setup for severe storms. I have been following the precip reports, even while on road trip, and this statement may be somewhat true for Cochise County and quite accurate for Greenlee County, but for the rest of southeast Arizona it is mostly a work of fiction. View of Catalinas above shows that this evening is ending much like day began - lots of cloudiness but only isolated storms around southeast Arizona. Yesterday - Moderate shower here at house during mid-afternoon dropped 0.20" - only the second day this summer with measurable rain. No lightning or thunder here. 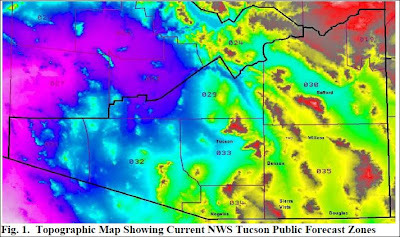 Gauges in southeastern Arizona measured generally light rainfall amounts, although there were very heavy storms to the east near Wilcox. The ALERT network observations indicate light rain at 28 of 97 sites during past 24-hours with a maximum amount of 0.28". Today and Beyond - the key words for the synoptic setting are stagnant and amorphous. The visible satellite image (top) shows heavy cloud cover over the region with light showers continuing - so many regions will not get a lot of heating during the day. There will be slight CAPE at low elvations that heat up and much better CAPE at mountain locations, especially those that get some sunshine. The wind profile remains very chopped-up, with a small layer near 400 mb having north-northeast winds around 20 kts and light/variable winds rest of troposphere. What a mess! The weak inverted trough over northern Mexico and southeastern Arizona is hardly moving, and thus is not really a significant player. The 500 mb pattern (bottom image) is very amorphous, with no well-defined anticyclone center, or significant winds, except along the southeast coast of the US. There is a well-defined, upper-tropospheric cyclone over west-central Texas; however, it is forecast to drift very slowly westward during the week. So, it looks like more of the same for next several days, with slow-moving, locally forced storms and some threat of intense rains with stronger cells. The 00Z sounding for Tucson this evening is shown above for 26 July 2010. There are several superadiabatic layers aloft and the sounding also appears to be 3 or 4 mm too dry wrt GPS precipitable water. There may be a fair amount of CAPE to support nighttime storms, but then again there might not. This example illustrates how difficult it can be to interpret soundings from the RRS sonde that have data problems. We've been away on a driving trip for the past eight days, covering about 2500 miles across New Mexico, Colorado, Utah, and Arizona. One night in Las Vegas NM - if you're ever through there avoid the Hillcrest restaurant at all costs. Four nights in Boulder while Katie attended a meeting. 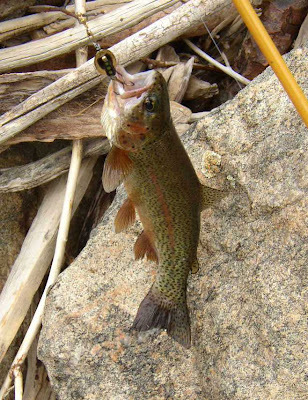 Son Jason and I ventured to the upper reaches of the Poudre River (lower reaches have been taken over by river rafters and kaykers), where we caught a few trout. Top photo shows a nice-sized, native trout that appears to be a cutthroat/rainbow hybrid - all trout released quickly. A thunderstorm chased us off the river, and we drove in light rain and showers all the way to northern Denver suburbs. Katie and I got to the Denver Art Museum on Wednesday and found that we far prefer the Milwaukee Art Museum. Thursday the 22nd we drove west across Colorado on I-40 and ended the day at Arches National Park - highly recommended and very beautiful, although much more crowded than when Edward Abbey worked there (as per his classic book, "Desert Solitaire"). 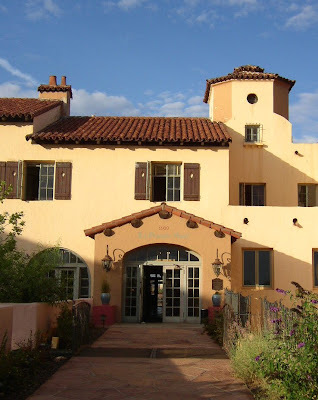 Stayed in Moab, which is a busy and very active mini-metropolis tucked into a spectacular setting along the Colorado River. 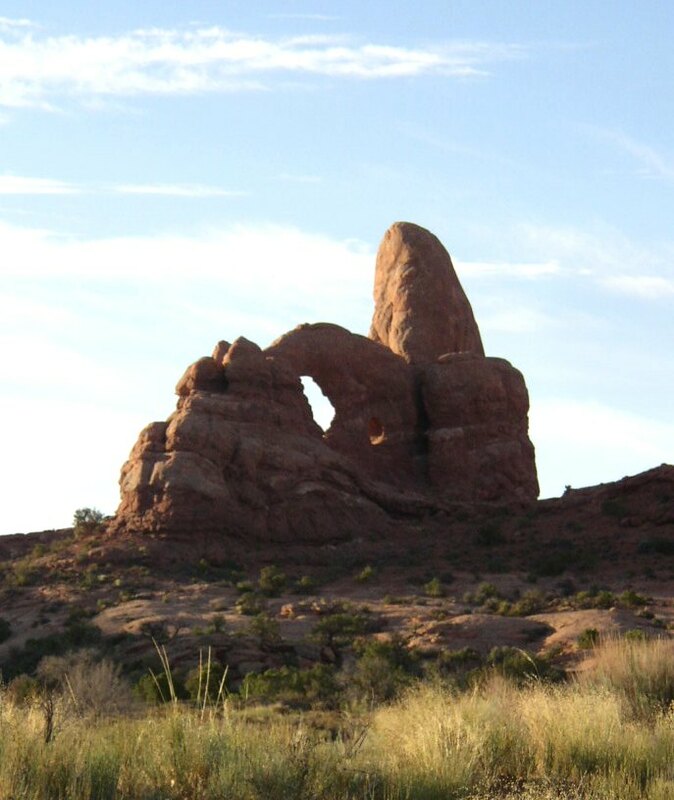 Returned to Arches in morning for some more photos, and then drove off to Winslow, Arizona, for our last night on the road. Winslow is known to Eagles fans as the "..standing on a corner.." town of "Take it Easy." However, it was also home to one of the famous Fred Harvey railroad hotels before WWII, La Posada, which is a favorite of ours. The hotel is slowly being restored and is home to one of the best, fine restuarants (the Turquoise Room) in the Southwest US (bottom photo shows what was the back entrance during the heyday of railroad travel, when the main entrance faced the trains and travellers on the Santa Fe tracks). During the eight days, we drove down stretches of Interstates 10, 25, 40, and 17, as well as several blue highways. Although there was lots of construction going on, we had no really bad delays. The horrible road construction that seems to have taken a decade in Albuquerque is finished, and the transit through there was the easiest and smoothest in years. The worst congestion and stop-and-go creeping along was between Colorado Springs and south fringes of Denver on Sunday afternoon. No construction, just the usual really bad congestion and slow downs for this highly stressed portion of I-25. The landscapes greened up east of Benson, Arizona, and stayed nice and green, often damp from recent rains, through the entire trip until we came down into Phoenix yesterday. Best thunderstorm we experienced during the trip occurred in Winslow on Friday evening with strong winds, lightning, and moderate rains. Finally, Arizona is making a big, uncomfortable, and negative impression on highway travelers and tourists this summer - as a budget austerity move the state has closed all its rest areas. Quite a stupid move from our perspective! More on the weather later today. Yesterday - Hot! as per WRF forecasts two days ago. Phoenix 113F and Tucson 108F. Storms yesterday were mostly locked to the mountains. Two regular reporting stations had light rain (Douglas and Nogales); 15 ALERT stations had rain and these were mostly around the strong thunderstorm shown in the 01Z Tucson radar image (top) that was centered in the southern Catalinas and foothills. This storm produced three rain reports of a bit more than half an inch and also a severe downburst along the Catalina Highway (so, first severe thunderstorm of summer in Tucson area - I think). There was rain also at 6 RAWS stations and amounts were very light, except fo 0.38" on Mt. Hopkins. Here at house nothing, except that I observed lightning for the first time this summer - off to far northeast around 8 pm. Today - Continues moist with little change in PWs and much cloudiness over all the Southwest and north to the Great Basin. System that brought severe storms to southern California yesterday is spinning along north of LA but main moisture is north in central Sierra Nevada and Great Basin (bottom satellite image). 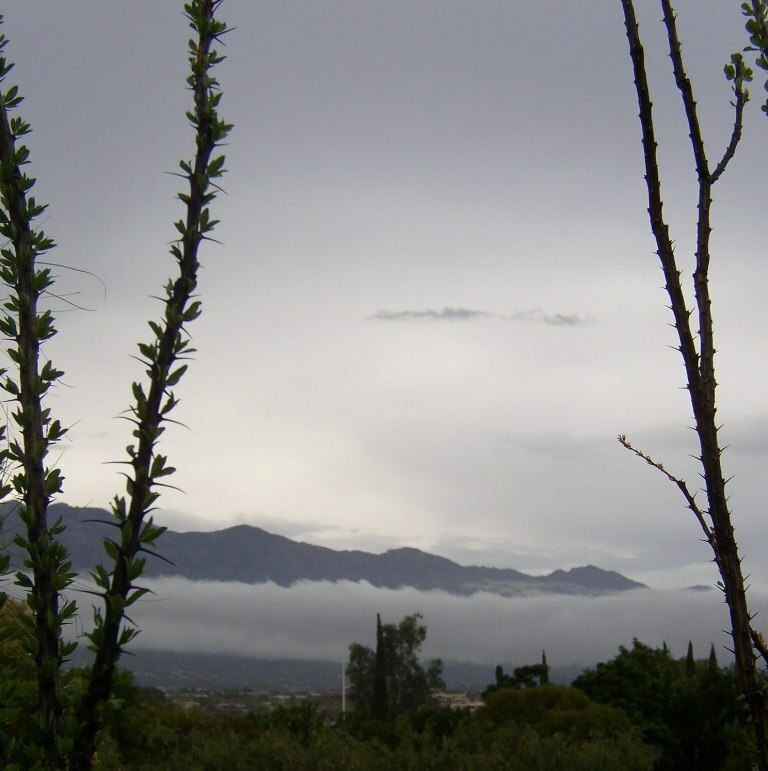 Middle image shows the heavy morning cloudiness here in Tucson. Tucson morning sounding is a bit cooler at 500 mb due to the tremendously deep boundary layer growth yesterday (see Jim Toth's comment below). There may a tad more CAPE at lower elevations. Low-level winds are strong southeasterly and upper-level winds are easterly, with some middle-level northeasterly steering flow. Big question is what will conditions look like this evening? The morning NAM shows a piece of inverted trough from Big Bend area affecting southeast Arizona after 00Z, and a somewhat supportive shear profile for propagating storms into lower elevations. So, today's storminess may depend to some degree upong the role of all this cloud cover and how long it will persist. The NAM now forecasts, again today, that tomorrow will bring better storms and rains, but shear profiles become less favorable as anticyclone becomes quite vertical north of here. So, main conclusion is that it's a tough forecast today, but strong storms with decent rains should be on the upswing today and perhaps through the weekend. 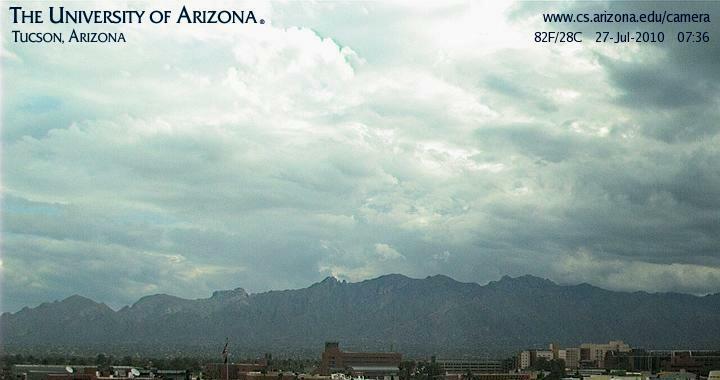 How Ironic - Summer Storms in Southern California Before Tucson Has Had Measurable Rain! Well, good call on the active convection today in Southern California. There were numerous thunderstorms, mostly over the Peninsular Range and adjacent foothills. I drove out about 15 miles east of my house and got into some very heavy rain, a bit of hail and some minor road flooding in mid-afternoon. Finally about 5pm a thunderstorm made it to my house and I got to experience the closest lightning I have ever seen/heard. I don't think I've ever heard the "ripping" electrical discharge sound that comes before the visible lightning and thunder, but I did today. It must have struck somewhere on my block. My dog and I both jumped a couple inches off the couch when the flash and real thunder came. We only got 0.04 inches of rain, but that's enough to make it pretty steamy (dewpoint of 73F). The most rain I've seen from any of the alert gauges was just under and inch, for a station just east of Palomar Mountain. My email to you back in June (see earlier post) turned out to be pretty lucky about forecasting the monsoon onset here. There were a few weak storms in the mountains yesterday, and some big ones south of the border, but today is definitely the main event. Yesterday – another mostly down day with some mountain storms and some anvil sprinkles over the Tucson metro area. The airport and DM each had 0.01”, while much of the rest of area had traces, as per here at house. No thunder observed here or at the air terminals. The ALERT network had rain at 11 of 93 stations, again mostly light – except a lunch hour heavy shower up on the Catalinas produced 1.02” at the Mt. Lemmon ALERT gauge. Only 3 eastern RAWS stations had light rain. The TWC soundings the last two evenings have had thermodynamic profiles that might have supported low-elevation storm, had there been strong outflows from the east – but done in by the L/V winds in much of troposphere. Today – PW remains moderately high at low elevation stations (42 to 45 mm) but winds in lower 2/3rds troposphere remain light. The remnants of yesterday’s upper-level inverted trough appear to out over northern Baja, extending into southwest Arizona (see WV image at top). Note also that the inverted trough/cyclone that has been stuck over the Pacific west-southwest of San Francisco still persists (I don’t know if this strange feature has somehow affected what’s been happening over the Southwest – any thoughts?). The morning soundings at TWC (middle image) and PHX have been modified by old cloudiness from the MCS that remained mostly inland over Sonora during the early morning hours – they are “onion” soundings and hard to evaluate for this afternoon. It is of note that the San Diego sounding is quite moist and has CAPE aloft over the marine layer – it looks like the best storms today may be over there in southern California. The NAM also forecasts some late evening activity along the Arizona borderlands, where there appears to be some upper-level difluence. Mountain forced storms could drift over random locales, and the NAM continues to forecast that mid-level steering flow will strengthen from the east. Tomorrow – The NAM model continues to indicate an improved situation late afternoon and evening for southeastern Arizona – see the 500 mb forecast valid at midnight Friday night in bottom image. Note that as the 500 mb anticyclone reconfigures itself, it appears that some cooler air could be advected around the eastern side – from northern Utah and northwestern Colorado into southeastern Arizona. 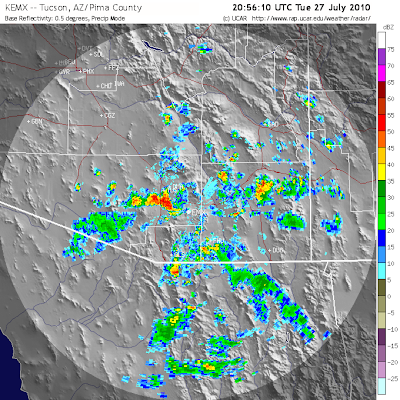 Thunderstorm activity shifted a bit to the north late yesterday afternoon - see IR image at top, which indicates a small MCS in the Nogales area. These storms tried to shift north during the evening but core echoes tended to remain on the higher elevations. The 00Z TWC sounding indicated no CAPE at the sounding site - but sounding was 5 mm too dry; so exact situation is not known. Anvil covered the sky at sunset, and we observed lightning far to the southwest (probably around Kitt Peak) from a foothills restaurant about 8:30 pm. There were a couple of sprinkles at the house during the night (another trace event) and the skies were heavily clouded over with middle-cloud debris at sunrise (some light showers and virga around the Rincons). Still have not observed lightning, nor heard thunder, nor measured rain here at house so far this summer. Rain amounts last 24-hours: Ft. Huachuca had 0.23" and Douglas had 0.27" while Nogales only measured 0.08". The Pima County ALERT network showed small amounts of rain at 7 of the 93 stations - only amount of significance being 0.24" at the Santa Cruz at Elephant Head Road. Four RAWS stations had decent rain amounts - Sasabe 0.37", Guthrie 0.48", Trail Cabin 0.77", and Stray Horse 1.07". So some decent rainfall but not widespread nor very heavy - best amounts at high elevations and along borderlands. Conditions remain moderately moist with GPS PW amounts over lower elevations of southern Arizona holding around 40 to 42 mm. Thus, situation is fairly similar to yesterday, with some CAPE possible but also continued light/variable winds lower portions of troposphere. There are stronger southerlies up at anvil level (not a good flow pattern for house, unless something develops nearly overhead). This morning's NAM forecasts for this afternoon and tomorrow afternoon indicate more of the same (considerable cloudiness over the entire southeast half of state complicates things a bit). However, the NAM gradually shifts the 500 mb anticyclone westward and northward some so that easterly winds slowly increase over northern Mexico and the borderlands. Model indicates considerably increased storm activity for Friday afternoon. 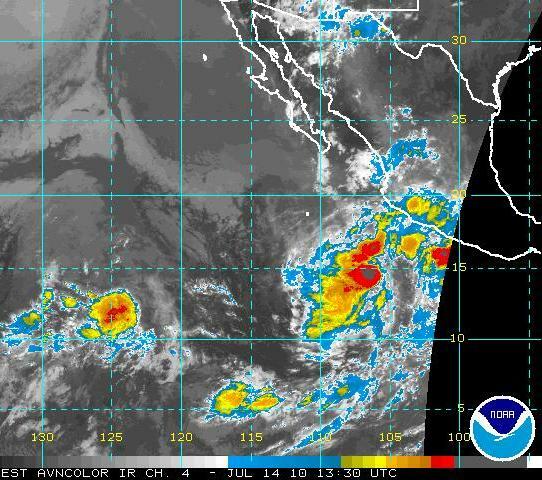 There is also a developing tropical disturbance in Pacific off Mexican coast that could come into play, so we should keep watch on low latitudes too. Yesterday – very suppressed locally and worst start to storm season here at house in 12 years – as per previous post. Douglas was the only regular reporting station with rain yesterday – thunder, gust to 47 mph, and 0.07”. There was a nice MCS last evening right along the border (see image) and this threw anvil north across Tucson area right at dark. The RAWS stations in the far southeast had storms and rain, with Rucker, in Chiricahua National Monument reporting 0.73”. 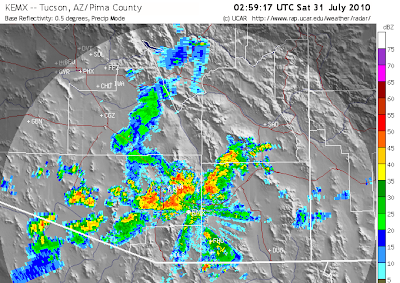 Sasabe, down southwest of Tucson, had a bit of light rain, as did 2 of the 93 ALERT stations. Today and Beyond – precipitable water continues to slowly trend downward and all the southern Arizona GPS sites are now around 32 to 35 mm. The flow pattern in the entire troposphere is very weak and chopped up in all of the Southwest and most of northern Mexico. The middle and upper-level anticyclone appears to be essentially vertical over south-central New Mexico. Flow at 850 mb over southern Arizona is westerly, and the 700 mb anticyclone appears to be centered over the northern GoC. Not much that is very positive for storms locally on the charts this morning. The NAM forecast run this morning gradually strengthens the flow around the anticyclone and brings several 500 mb inverted troughs across the lower portion of the GoC. Thus, the model indicates an improving synoptic setting for storms as the week progresses. I do recall that last summer we seemed to have a very difficult time getting moisture, CAPE, inverted troughs, and steering flow all nicely setup at the same time – hope that the repeat of that scenario doesn’t last much longer this year. Home gauge picked up 2.50" - all from the evening storm. EPZ office about 3 mi to my NW picked up 3.01, about 0.20 of which fell in a midday thunderstorm. Other West El Paso sites picked up 1-1.50 inches. Central E.P. 0.80" ... Northeast E.P. 0.53" ... lesser amounts farther west as the deeper convection died out while heading east. Other 24hr totals (thru 12z) include 2.58" near Hatch/Rincon, NM, 0.75-1.50 over the Sacramento Mountains, 1.25-2.00" around Alamogordo, Around 0.50 inches in Las Cruces, 1-1.50 in parts of the Gila Region, and about 0.30-0.50 over the NM Bootheel. Post-analysis showed the MCV/TD#2 Remnants... an upper-tropospheric low of some sorts that moved from northern Baja into NM...and a northern stream shortwave trough moving across the Central Rockies all had some impacts on this event. Afternoon satellite image shows very distant storms at 4:30 pm on July 12, 2010. View of Catalinas from Computer Science webcam shows - if one looks carefully - two tiny cumulus over the mountains. Which leads me to ask how bad and how dry has the start of summer 2010 been here at the house in north part of Tucson? I have daily rain records here since summer 1999 - so, I can examine the 11 past years. During NONE of these years did I not have measurable rain and thunderstorms before the end of the day on July 12th. So, 2010 has been the latest and driest start of the summer thunderstorm season, since I started keeping records here at house. Art Douglas' summer outlook, posted here last month, certainly seems on track. The year with the least rainfall through July 12th was 2002, with only 0.10". However, three years had more than 2.00" at this date, and five of the eleven years had more than 1.50" at this date. So, this year's summer has started out very seriously dry. I'm heading outside to water some dessicated plants in the yard. Yesterday – Even given the moisture and instability of early yesterday, the day turned out to be yet another serious disappointment locally. The remnants of TD-02 mostly pulled out to the northeast, although an elongated, sheared and weak trough remains at 500 mb to our south. Only one brief, late morning shower formed on the eastern Catalinas. No thunder, lightning, or rain observed here at the house. Best storms, and some were cold-top convection with quite a bit of lightning, were to the southeast to southwest and up in the White Mountains. Outflows from several different directions converged in the Tucson area before dusk, but the evening sounding was CAPEless, so a nice convergence event went wanting. Only 17 of the ALERT stations had rainfall but most of the RAWS stations had at least a bit of rain. Ft. Huachuca reported 0.54” and other notable amounts were: Sasabe 0.98”, Rucker 0.61”, Haystack Mountain 0.59”, and Carr 0.57”. 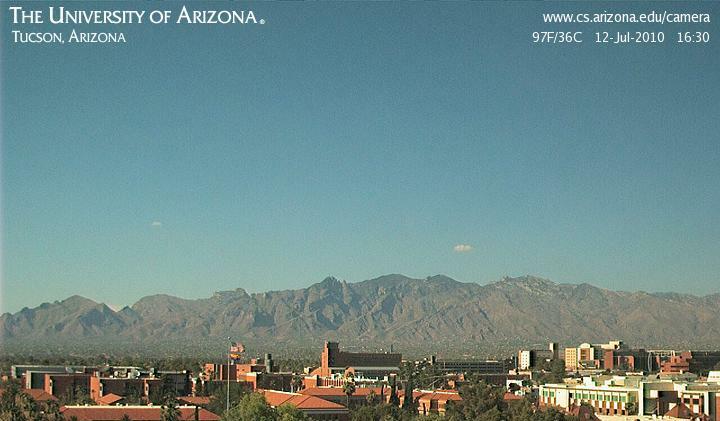 So, a really feeble start of the season here in the metro Tucson area – and we remain “high” and dry here at house. Note that Art Douglas reported yesterday that it has been a very slow start to the rains down in Ash Canyon, with him recording only 0.57” for the month – although, it looked like there were several storms down there yesterday afternoon. Today – Very moist conditions continue in lower-half of troposphere with PWs at low elevations around 40 to 45 mm. 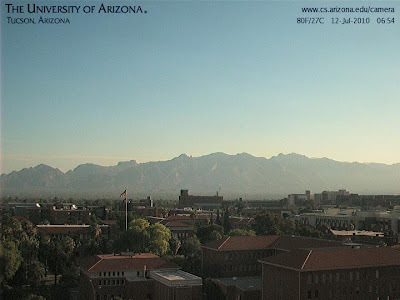 Sky this morning clear and very hazy, almost like a Midwest summer morning (see view of Catalinas). The TWC morning sounding (above) has moistened some below 700 mb and dried above 400 mb. If the morning conditions persist and mix out by mid-afternoon, it appears that mean boundary layer mixing ratio would be around 10 g/kg and that there’d be a nice bit of CAPE (however, yesterday mixed out at 8 g/kg with no CAPE). Winds in troposphere are mostly light and variable, so today’s steering appears even more uncertain than yesterday (yesterday the steering flow clearly became northeasterly). Ordinarily, I’d say that there was an excellent chance for a storm from Catalinas to drift over the house today. But, we seem to be snake bit and models keep most activity in the borderlands again. So, I’ll just sit and watch. Yesterday – Again mostly weak and warm-top convection with best storms and rain amounts up at high mountain locations. Of the regular reporting stations, Douglas had thunder and 0.13” and several other stations had lightning or thunder but at most a trace of rain – appears that sprinkles during the night brought a trace here at house. 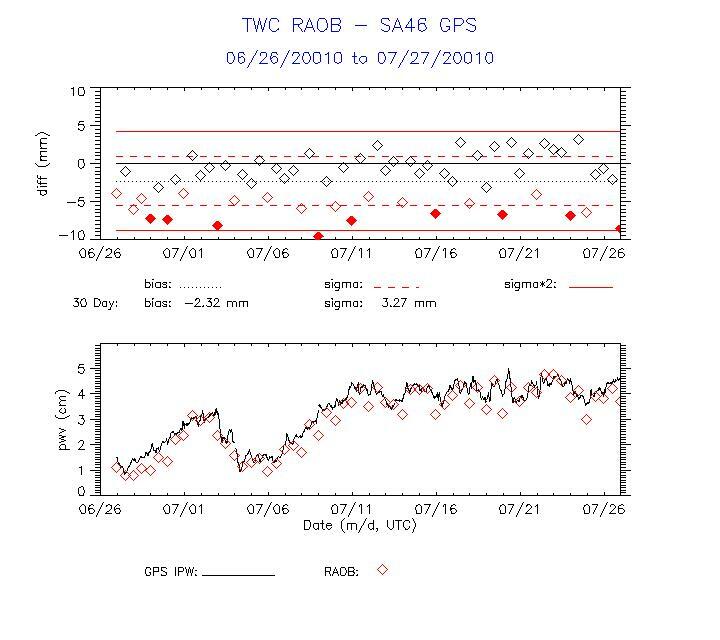 Several RAWS stations had rainfall – Mt. Graham 0.53” and Mt. Hopkins 0.47” – the ALERT network shows rain at 24 of 93 stations during past 24-hours (with 0.55” at Mt. 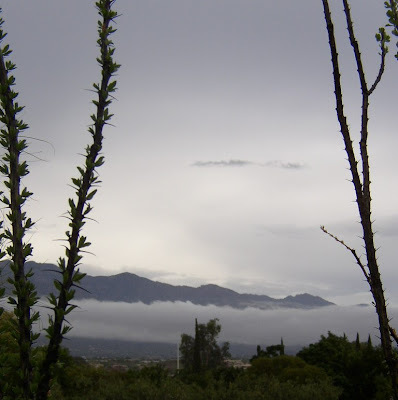 Lemmon and 0.47” at Rincon Creek); again the rainfall occurred mostly at the higher elevation ALERT sites. This Morning and Today – Very moist and with light surface winds this morning. The GoC moisture surge passed Yuma at about midnight last night (see KYUX VAD above) and extends to about three thousand feet (good call Pat H.). The remnants of TD-02 appear to be spinning south of the New Mexico bootheel (see El Paso radar above) this morning, with deep convection in the core. Values of PW are very high across all of southern Arizona with amounts from upper 30s to around 45 mm – so no shortage of moistur, as per last couple of days. Warm inversion aloft has been beat down by three days of warm-top convection and there is CAPE (not great) at low elevations and much better CAPE at high elevations – definitely should be some cold-top storms around later today. The TWC sounding (bottom figure) indicates we’ve got a very chopped-up wind profile. The strongest winds are north to north-northeasterly but down between 600 and 700 mb and winds above 400 mb are southwesterly – steering flow unclear, and storms will probably propagate wherever they want to. Looks like heavier rains possible today. This morning’s NAM shears old TD-02 out stretching it from northern GoC to south-central New Mexico by evening – however, current satellite loops seem to indicate the core is moving to the northeast toward El Paso. The NAM keeps best rainfall to south along the borderlands, but some mountain storms will probably come down into lower elevations, so it’s a bit of a coin-flip for us lowlanders today. Certainly not a very great situation toda, but probably the best setup of the summer to-date.